We are still having a problem with parking on the footpath alongside the Old Vicarage. The school have been asked not to do this and Councillor Moor will visit the houses on the opposite side of the road and ask if they could ensure their visitors do not park on the footpath, but just in the road. The seat outside the Village Hall has been mended. A letter of thanks to be sent to Peter Holloway for doing this. The residents of the Old Rectory had contacted the Chair to say the work to the tree/hedge by the footpath was in hand. 5. 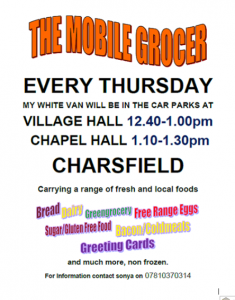 Points from the public – A chance for the public to raise matters of interest relevant to Charsfield. Tony Fryatt, District Councillor for adjoining parishes, attended at the request of Ray Herring, Leader of the Council. This was due to continued non-attendance of our District Councillor. Councillor Fryatt’s report is attached. The Mobile Speeding Sign has been ordered and we are still waiting for it to come from Germany. The Clerk had written to the Highways Department again re the national speed limit section on the B1078 between Shrubbery Farm and Valley Farm. Unfortunately, they do not have funding for any investigation into the pros and cons of changing the speed limits in Charsfield. DC/18/0349/FUL – The Old Vicarage- variation to original proposal – The Parish Council has no objection to this application. The Local Plan has identified a parcel of land near St Peter’s Close for 20 dwellings. Should a Planning Application be made the Parish Council will respond to the needs of the village, currently thought to be for bungalows and affordable housing. Councillor Fryatt reiterated the need for a Neighbourhood Plan. 9.3 Another bank signatory is needed as Councillor Owen Williams did not feel she could undertake on line banking and Councillor Moor volunteered to take this on. The Clerk will obtain the necessary forms. 9.3 Bank reconciliation was agreed and is attached to minutes. The insurance documents had been previously circulated and it was decided to accept the five year option provided any changes to the policy throughout this period could still be made. This was proposed by Councillor Moor and seconded by Councillor Laird. The Clerk explained she has been in contact with CAS (the insurance brokers) re both the Parish Council Insurance and the Village Hall Insurance. A solicitor from CAS wishes to have a meeting with us and a member of the Village Hall Management Committee re the insurance and the Governance of the Village Hall and we are waiting for him to send us some dates. Councillor Godwin volunteered to act as the non signatory Councillor required to complete the check list at least once a year. This should be November/December time. This was agreed by Councillor Moor and seconded by Councillor Murray. The Recreation Ground Committee had made a request for grant towards a new picnic bench at £585 ex VAT. This was agreed by Councillor Moor and seconded by Councillor Murray. Clerk to contact Jo Wyatt. Councillor Moor went through the Emergency Plan. There would be a cost of circa £500 for some equipment. There are still a few names/numbers missing but when this is completed it will be passed to SCDC for ratification. A copy of the Plan together with the various items of equipment needed would be placed in a box and left in the village hall. Councillor Godwin asked about the implications of Data Protection and this is to be looked into. The Parish Council thanked Councillor Moor for all her hardwork in pulling this together. Before going live it was suggested we have a meeting with all the volunteers on the list. The Clerk will write to D J Spall Recovery to ask if they could help with the removal of the paint on the kiosk. The pads will expire on 3rd November. The PC agreed to replace these at a cost of £35 a pair. Two pairs are needed. Clerk to order. The meeting closed at 9:00 pm. This has been the time of reduced activity over the holiday spell. We all had long holidays! The main activity over the period has been the consultation on the Draft Local Plan. There has been considerable interest in the Plan and many public meetings and one-to-ones were held. The closing date was 14th September. Work is now in progress to analyse these results. Discussions have been taking place to decide how the Planning Committee structure might be adjusted when the two districts combine to form East Suffolk. Alongside the retention of the requirement to identify and update annually the five year housing land supply, it introduces the Housing Delivery Test as a mechanism for assessing recent housing delivery across a local planning authority’s area. The details have not been published but it will mean that we will be assessed on the number of houses actually delivered each year. Failure to meet the targets will incur special measures. This could need some significant changes in the planning function to force completion of developments once consent has been granted. Given the increase in viability challenges from developers that have taken place over recent years, there is guidance as to how these should be handled. In future all viability assessments will be made public documents. Very often these viability challenges relate to the need to provide affordable housing but it can arise from a Section 106 charge. The Framework stresses the need for efficient use of land and the need to maximise the number of houses that should be considered for a site. The original draft proposed that 20% of houses should be built on small plots (half hectare or less). This has now been reduced to 10%. Emphasis is given on the importance of Neighbourhood Plans. The expectation is that the NPs will play a vital role in the definition of the special qualities of an area It also introduces the requirement for the LPA to quantify the number of houses expected in a Neighbourhood Plan area. Suffolk Coastal’s successful Garden Waste Scheme will shortly go hi tech. Special ID tags will be embedded in the new, bigger green bins, before they are delivered to scheme members that have opted in for the upgrade. The hi tech tags – radio-frequency identification (RFID) tags, to give them their official name – work in a similar way to barcodes and smart labels. A unique identifier is encoded in each tag which can be “read” by a special device that the bin lorry crews will have. We will record which bin has been delivered to which property using the unique identifier. Staff will also be going round to fit the ID tags to the smaller brown bins where people have not opted for the upgrade and want to stick with their existing bin. The first paid-for collections of garden waste began in May, after Suffolk Coastal District Council introduced a £43 a year charge for collecting garden waste. One of the benefits of joining the Suffolk Coastal Garden Waste Scheme is that subscribers can get a free upgrade – receiving a larger (240 litre) green bin for their garden waste (240 litres is the most common wheeled bin size, but the current brown organic waste bins in Suffolk Coastal are 140 litres). About 32,600 households (or about 56% of homes) have now signed up for the Garden Waste Scheme. Of these, 80% have opted to get the new, larger green bins. The main delivery of the new larger green bins will start in October and will be carried out area by area, to households that have subscribed to the garden waste scheme and opted for the upgrade. These bins will already have had the tags fitted and an address/bar code sticker fixed to them. We will also be carrying out a phased ‘retro-fit’ of the tags to the brown bins, where people have joined the garden waste scheme but have not opted to have one of the new larger green bins. Detailed roll-out plans for the delivery of the new bins and retro-fitting of ID tags to brown bins will be publicised in September. So people do not have to do anything at this time…..we will publicise the plans on our website once they have been finalised.